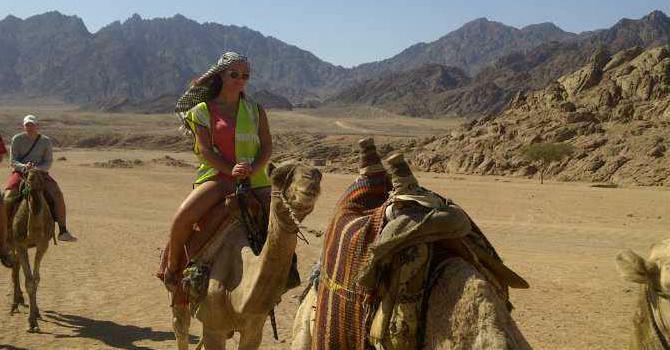 We will pick you up from the hotel with comfortable air conditioned van and expert tour leader then drive to Wadi Mandar, it is a Bedouin valley about 30 KM from Sharm El Sheikh deep in Sinai desert. Relish this memorable 30 to 40 minutes camel experience that takes you to the highest point in the valley to admire the stunning sunset science. Continue to the Bedouin tent to savor the open buffet meal in this open atmosphere while you wander the folkloric Bedouin show including oriental Belly dance, Tanourra Skirts and fire show, then you will experience the start gazing through the telescopes with scientific presentation of our specialist astronomer then drive back to your hotel.